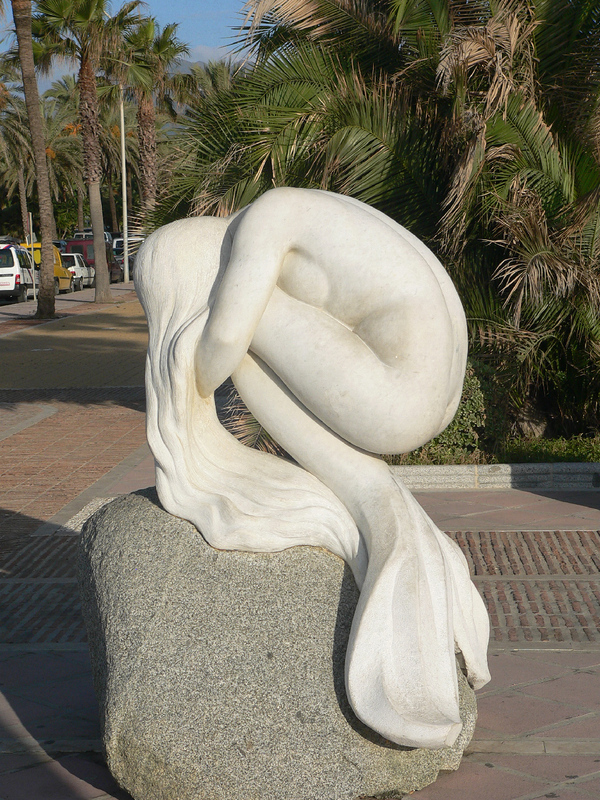 This wonderful rendition of a mermaid in granite and marble was created by Barcelona sculptor Antonio Cañete, and is located on the waterfront promenade at the Puerto Jose Banús harbor on the west side of Marbella on the south coast of Spain, about 30 miles from Gibraltar. Mermaid statue La Sirena Puerto Banus Marbella in Spain. Photo © by Chris Robertshaw. Puerto Banús was created in the 1970’s and has become one of the key attractions in the Costa del Sol area, with 5 million visitors annually. There are many works of art here. With her location right on the beach walk promenade next to hundreds of yachts in the port, La Sirena has a prominent location in the sun and further enhances the natural beauty of the town and this area of Spain. For more information and photos of this statue, see La Sirena de Puerto Banus.